Vintage 1930s Makeup Styles Revisited! 1930s Makeup styles were the most glamorous and refined. The look was more feminine than that of the 20’s. Eyes were less severe yet with added color. Blush and hairstyles were softer. Here you’ll find out how to recreate the look with a more modern touch. This is the decade where a beautiful face was achieved with a lot of artificial traits. Namely, flawless skin, unnaturally thin eyebrows, and the perfectly proportioned cupid’s bow lips. The biggest influence on the look we’re movie stars… The cinema was a great escape from the great depression! You could go there and forget about those couple of thousands you just lost in your net worth. If you'd like to take a peek at a restored actual 1930s hair and makeup guide, glamourdaze has some very good ones in e-book formats. The skin was flawless and completely porcelain. So we’re going to aim for zero imperfections and a matte finish. To achieve this, you will need a primer, maybe concealer, your regular foundation, and compact powder (translucent or colored). Apply primer all over your face. This is to fill in the pores and even out the skin. Let your primer completely dry before applying any concealer or foundation. Use concealer to hide issues that you know you can’t cover with foundation. So dark under eye circles, spots, and scars can be dabbed with concealer to fade them into the background. Then apply your favorite foundation for a clear, even complexion. When you’re done, pat on a powder to keep shininess at bay! The eyebrows were rounded, and plucked into the thin line that today fills our hearts with horror! We only began to see fuller lashes towards the very end of his decade. To update this look, you can go either of two ways. The first is to pluck your eyebrows to resemble the shape (without the thinness). The other is to brush them into a rounded shape. If you’d like to go the shaping route, create a rounder brow with your own. Then refine the shape by filling the brows in. Then line with a brown eyeliner that matches your brow color. Blend the color using an eyebrow brush so that no lines are visible. Maintain the thickness that corresponds with your nose and ears. So if you have big features, ground them with thicker brows and vice-versa. Round eyebrows are a friendly, feminine shape that softens your profile. If your look is more edgy with a defined arch, you may want to just temporarily brush them into a curve. To keep the shape in place, brush them with an eyebrow gel or a teeny tiny bit of Vaseline. To do this, start by brushing them upwards. Then trace a rounded curve along the top of the eyebrows with your brush. The eyes were soft and yet glamorous. One eye shadow color was used all over the lid. Use a matte eye shadow in a color that brings out your eyes. Then line the top lash line, while keeping the bottom lash line soft. Line it with black or brown eyeliner, and smudge it using a liner brush or your pinkie. 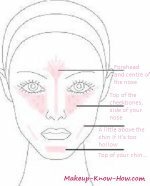 To create the cupids bow shape, apply foundation over the lips. This way, it will be easier for you to create the bow shape on the top lip. Use a lip liner in a similar color to your lipstick to outline the lip shape. 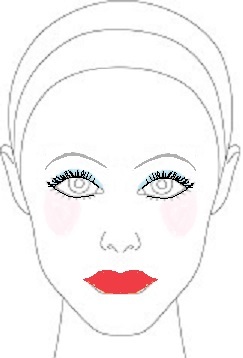 Draw a v-shape that follows your bow, then line the rest of your lips following the natural curves. If you want the lipstick to last longer, you can even fill in with the liner. Then apply your first layer of lippie within this line. A lip brush will help you to be more precise. Blot with some tissue by placing it over your lip. Then apply about two more layers, blotting in-between. This helps the lipstick stay on for longer. Add a bit of gloss for shine, if you've used a matte lipstick. This is after all, the decade when lip gloss was invented!